OK dokey. 50 Hour Trivia Marathon is over. 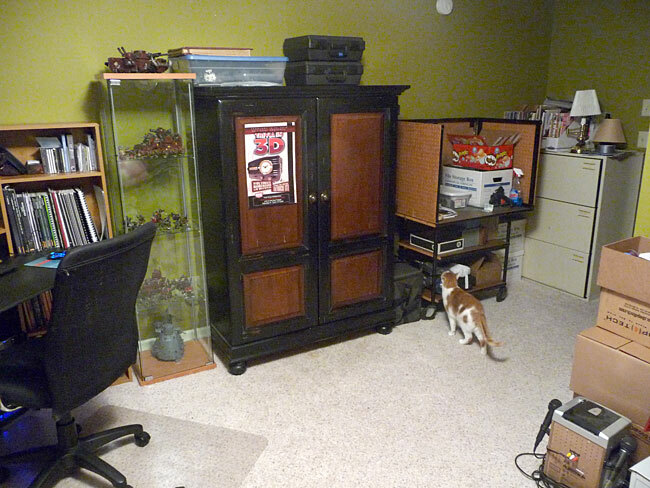 The house is back to normal and I’ve got the lions share of the modeling stuff setup in the new hobby room. Here’s the situation before. 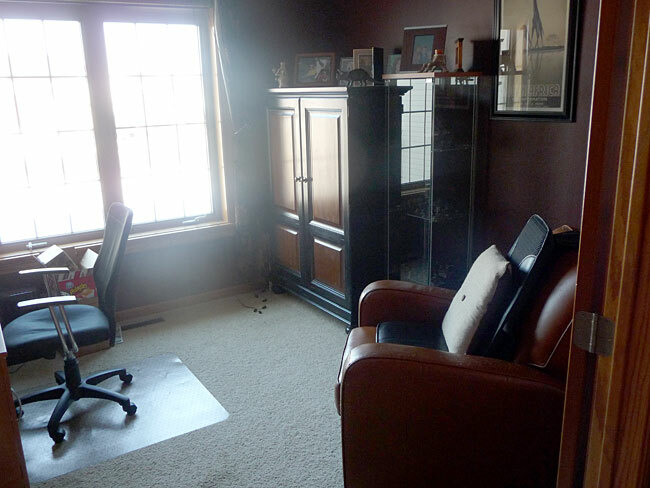 One small hutch and a large computer desk (at left, out of frame) that I shared with my wife. Most everything that didn’t fit inside the cabinet was stashed/hidden in different closets all over the house. Starting from the left. Cutting/building station. Anything dealing with actual building is done here. I’ll be replacing this small artists table son with a metal table that’s a little larger. 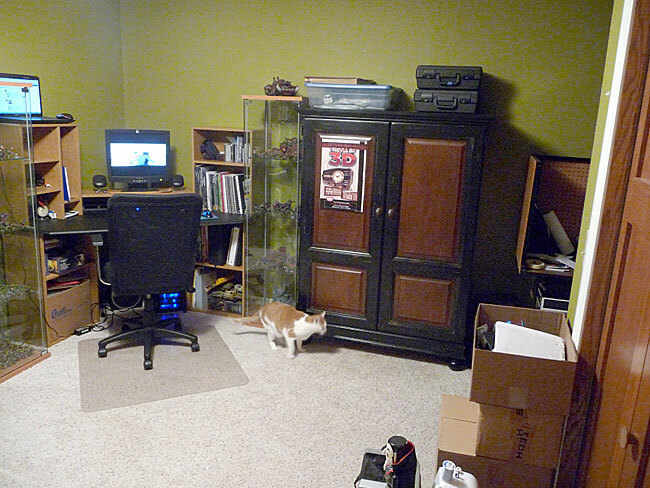 I have yet to unload all the boxes and tools that will be set up here. There’ll also be power strips up either side of the table so I can plug in small powertools/hairdryers/drills. etc. easily and hang them over the edge of the table. Computer desk. $25 on Craigslist. I love Craigslist. Computer and gaming books are here. Painting Hutch: This is the original one from upstairs only this time it houses only stuff for painting. Airbrush Station. This is a multifunctional space. 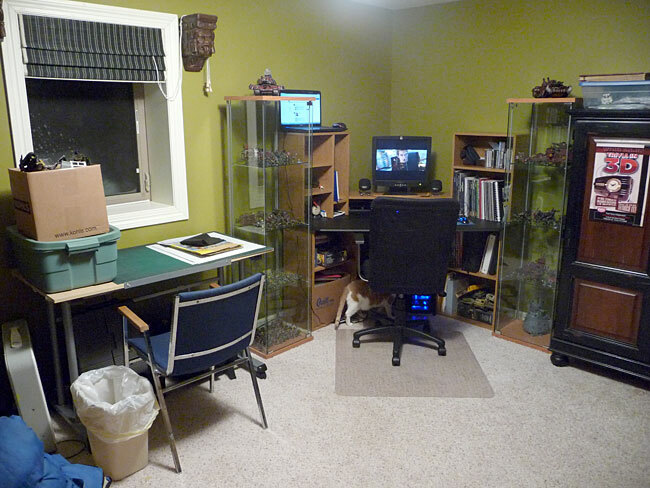 I will use this as a small photo studio for taking pics when I’m not using it for an airbrush stand. I’ve got an old range hood from a kitchen remodel my wife and I did years ago that will be placed on top with some filters placed around and on top. This will allow me to airbrush indoors as it’ll be vented and filtered. I am very, very excited about this portion of the expansion. I’ll be finishing the painting on the two slavers and Mek Boy in the next week. I’m kinda looking forward to getting back into the swing of things 40K related.